Citation Information: J Clin Invest. 2007;117(12):3846-3856. https://doi.org/10.1172/JCI31871. 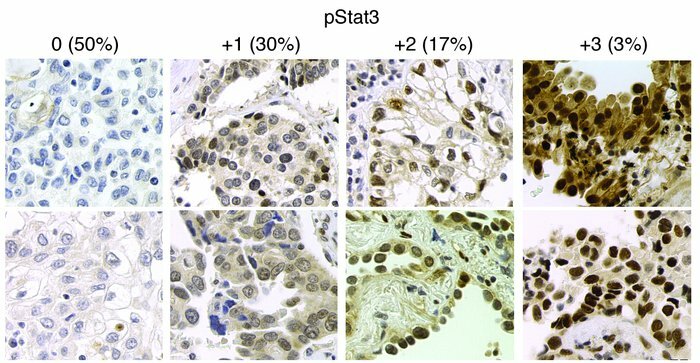 STAT3 is tyrosine phosphorylated in primary lung adenocarcinomas. Immunohistochemical analysis of 92 primary lung adenocarcinomas for tyrosine-phosphorylated STAT3 was performed; 46 were scored as 0; 27 as +1; 16 as +2; and 3 as +3, with associated percentages indicated in parentheses. Two examples of each are shown. Original magnification, ×200.